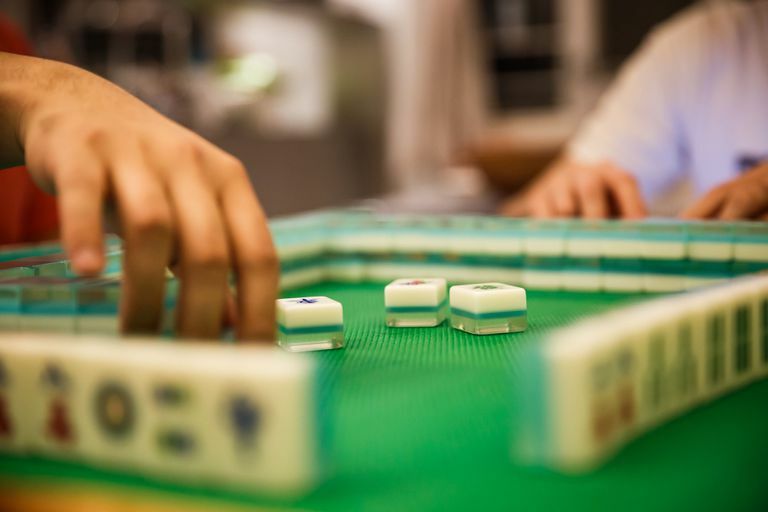 While the origin of mahjong (麻將, má jiàng) is unknown, the fast-paced four-player game is popular throughout Asia and is gaining a following in the West. The game was first sold in the US in the 1920s and has become popular in the last decade. Mahjong is often played as a gambling game. Therefore, mahjong was banned after 1949 in China but reintroduced after the Cultural Revolution ended in 1976. There are variations in gameplay from country to country. Mahjong sets contain 136 or 144 tiles. There are 16 rounds in a game with a winner after each round. This article will teach how to play the more common version based on 136 tiles. Approximate playing time is 2 hours. Before playing mahjong, it is important to identify and understand each mahjong tile. Similar to poker, the goal in mahjong is to get the highest combination of tiles which are called sets. 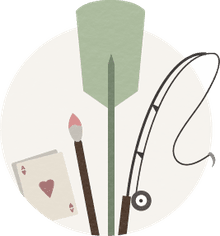 Players must learn what the sets are before playing mahjong. Once players can identify and understand each tile and have learned the sets, the mahjong game can be set up. To get up the game, first, place all the tiles face down on the table or game board. Then players wash, or shuffle, the tiles by placing the palms of their hands on the tiles and moving them around the table. Next, each player builds a wall in front of his or her playing space. Taking turns, each player rolls the three dice. The player with the highest total is the ‘dealer’ or ‘banker.’ The directional die is placed in front of the dealer. The directional die helps the players keep track of the player game wind (門風, ménfēng or 自風, zì fēng). The ‘dealer’ begins with the die East Wind (東, dōng) face up. After four rounds of serving as a dealer, the player to the dealer’s left places the South Wind (南, nán) face up. The third player is the West Wind (西, xī) and the last player is the North Wind (北, běi). Each player serves as the ‘dealer’ for four rounds. Using the total number the dealer rolled with the three dice, the host counts the tiles along the wall in front of him. For example, if the dealer rolls a 12, start with tile number one on the top row all the way to the right. Moving clockwise, count the tiles and stop at number 12. Make a space between the 12th and 13th tiles similar to cutting a deck of cards in a card game. The dealer takes a chunk of the mahjong wall that is equal to four tiles, two from the top row and two from the bottom row. Then, the person to the dealer’s left takes the next four tiles and so on. Each player takes his or her turn in a clockwise motion grabbing four tiles each until the dealer has 12 tiles. Then, the dealer takes four tiles again, but not in the same method. This time, the dealer takes a chunk of two tiles—one from the top row, one from the second row—skips the next two tile chunk, and takes the next two tile chunk. This dealing move is called, "jump jump." Then, like before, the person to the dealer's left takes the next four tiles, and so on until each player has 16 tiles. All tiles remain face down and are not to be shown to other players. Once game play has started, each player looks at his or her tiles by placing them in the rack or on their sides. The tiles should remain hidden from other players. Any tile combinations automatically drawn, such as straights or three-of-a-kind, should be placed face up in a set order in front of the player. For example, if there is a straight using two, three, and four, the tiles should be placed in numerical order: two, three and four. The dealer draws one tile from the wall. Then, the dealer can choose to keep the new tile to help create a set or discard it. If the dealer chooses to keep the new tile, then he or she must discard one of his or her original tiles. While 17 tiles are needed to win, only 16 are kept at each turn unless the player is declaring victory. The player to the dealer’s left can either draw the next tile from the wall or take the discarded tile that the dealer discarded. Regardless of which option the player takes, the player can choose to keep the new tile to help create a set or discard it. As players continue to create straights and three-of-a-kinds, they call out the name of the set and place it in front of their play area. Players who opt to take the last tile discarded (the tile discarded by the player to his right), can only take the tile if it completes a set. When drawing a tile either from the wall or from within the walls, if it creates a four-of-a-kind, say “gàng!” Just as with chī and pong, players can grab a tile out of turn if it gives them a four-of-a-kind. After placing the four-of-a-kind in from the player’s game area the player takes an additional tile from the wall. However, the tile is taken from the opposite end of the wall. The game ends when all wall tiles are taken or a player declares victory with either five sets of three tiles and one pair or four sets of three, one four-of-a-kind, and one pair. If a player declares victory but is found to actually not be the winner, the situation is called (詐胡, zhà hú), and the false winner must pay all the other players. At the end of each round, payment to the winner may be made if the game is being played for money, and points for each player's hands are tabulated. If a player makes a mistake in grabbing his or her tiles during step 8, for example, if he or she takes less than 16 tiles or more than 16 tiles, the player is called 相公 (xiànggong, messire or husband). This mistake should be avoided because this player will not be able to win the game because he or she has violated the rules. The player must continue to play the game, but he or she is doomed to not win. When another player wins the game, the 相公 must pay extra money. When a player discards a tile in the center of the walls, if it completes another player’s set, that player can grab it out of turn and say “chī!” for a straight or “pong” for three-of-a-kind. Then, the player must immediately place the set that includes the newly grabbed tile (called the ‘stolen’ tile) in front of his play area. The ‘stolen’ tile should be placed in the middle of the three tile set. If a tile is taken out of turn, the players who were skipped lose their turns and play continues to the left of the player that called chī or pong. If gàng happens at the end of the round, then the victorious player must have four sets of three, one four-of-a-kind, and one pair from any suit. While this would equal 18 tiles, a four-of-a-kind is counted as one set of three tiles. A complete mahjong set of 136 or 144 tiles which includes 3 ‘simple’ suits: stones, characters, and bamboos. The set also includes 2 ‘honor’ suits: winds and dragons. There is also 1 optional suit of flowers. With regards to dying, there is 1 directional die and 3 normal dice. Then there are 4 optional racks for players to place their tiles on.